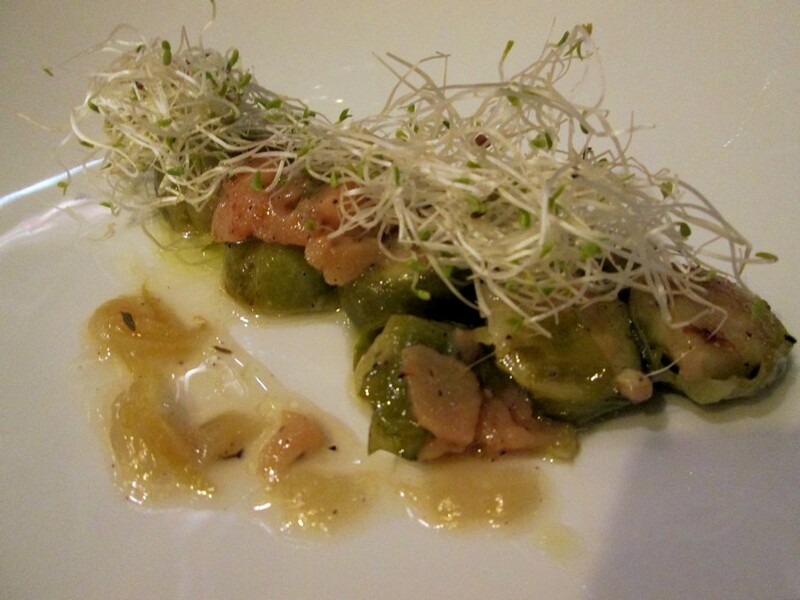 Restaurant review #3 – restaurant Patrick Devos always offers a vegetarian menu. We asked them whether it was possible to get a vegan menu (explaining what this means – what we do eat and don’t eat), and they affirmed! The vegan menu would be the same as the vegetarian menu, but without the dairy and eggs. A vegan 3- or 4-course menu is respectively 35€ and 45€ (with accompanying wines resp. 53€ and 69€). Shortly after, we called to make a reservation and mentioned ‘vegan’ again, and it was no problem. We could dine there the same evening. 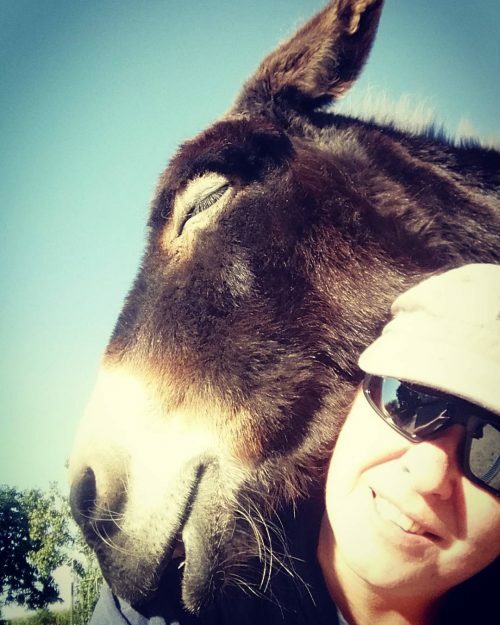 We hadn’t heard any other experiences from others about restaurant Patrick Devos, so we were pretty curious! The restaurant is in the center of Bruges, in the Zilverstraat. It is located in a beautifully restaured historical building, dating back to the 13th century. 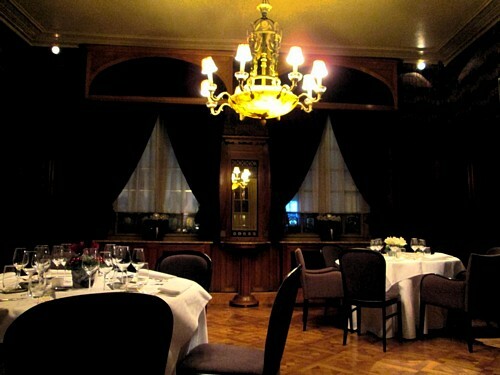 No medieval decor, but a classy dining room in art deco style, with beautiful glass windows. We took the aperitif in the salon. The suggestion was a special Belgian champagne (forgot the name). Although appealing, but 20€ for a glass of bubbles seemed a bit over the top to us 😉 We settled for a glass of cava, with 11€ a glass also ticking to the bill (but indeed very smooth and nice). 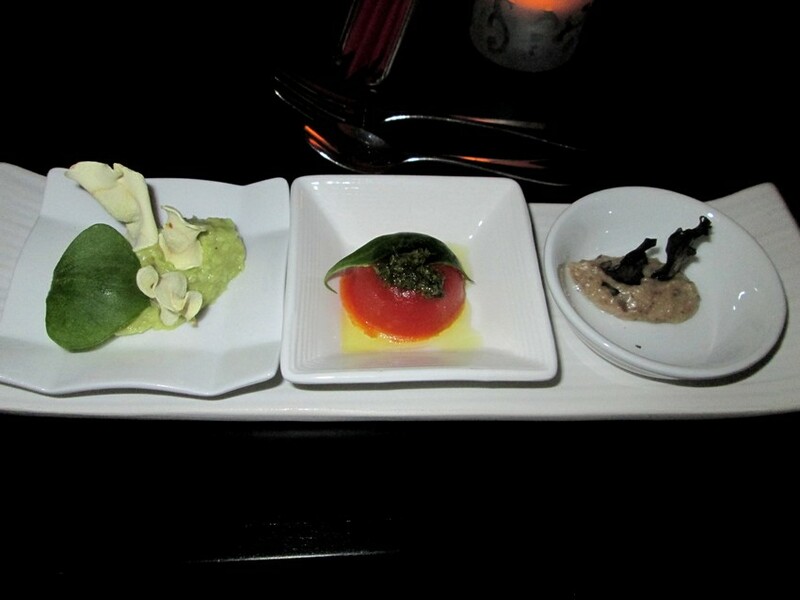 We got a plate with 3 little dishes: avocado with parsnip and purslane, flan tomato with green pesto and mushroom creme. Very refined and nice! We were seated at the window, looking out to the garden. I suppose you can dine outside in summertime. All courses were accompanied by a bread roll (with seaweed, tomato, brown or white) and we had a little bowl of delicious olive oil on the side, regularly being filled up. The kitchen also uses different olive oils according to the flavour of the dish. 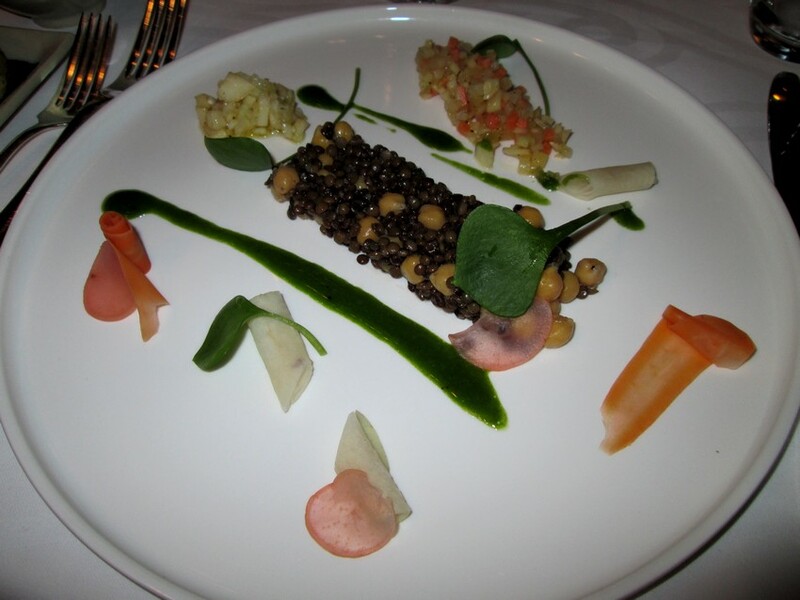 The first course was presented as lentils with soybeans, brunoise of vegetables, apple, watercress and purslane. Very nice, although we should note that these were not soybeans with the lentils, but chickpeas. This was followed by Brussels sprouts with quince, salad of shoots and lime sauce. A surprising but very tasteful combination of sprouts with citrus, which we would love to try out at home! 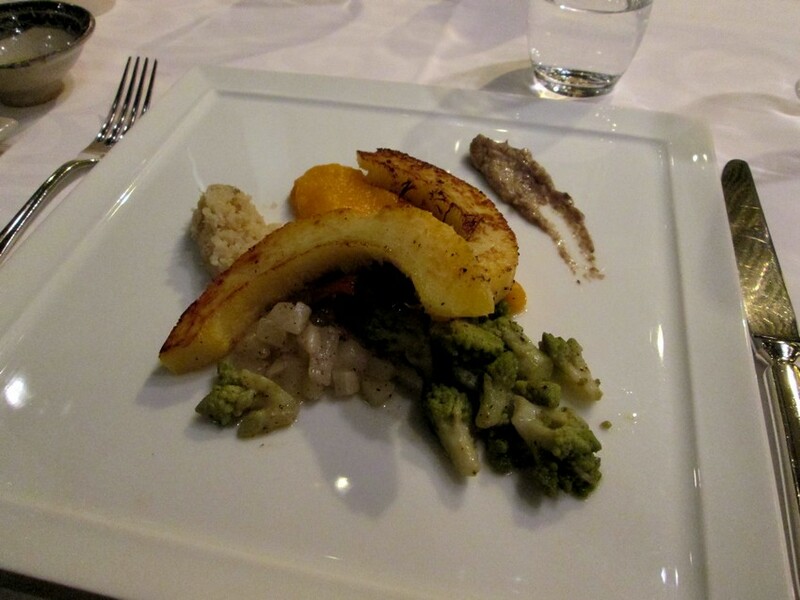 The last dish was buton squash with forest mushrooms, quinoa, butternut mash, romanesco with mushroom sauce. Very enjoyable, but for me, it could have done with some more spicing. Dessert was a rather classic dish with fruits and sorbet. 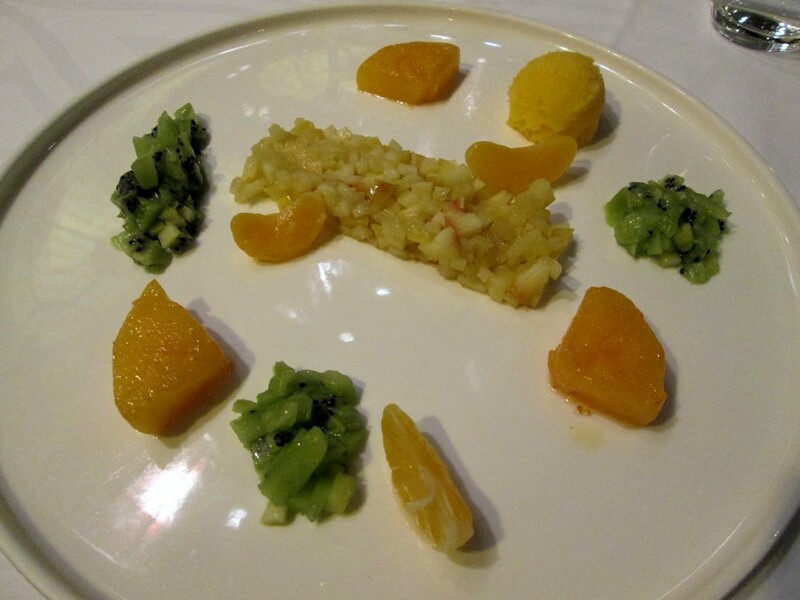 Although the sorbet of mandarins and the persimmon made it pretty exclusive! To our surprise, following dessert the waiter served us a plate of mini-pastries and cakes, but when I inquired what these were, he realised his mistake ‘oops, you don’t eat this!’ and off he went with them! We’ve never encountered vegan pastries in a traditional restaurant, so this really would have been unique! 35€ for a 3-course or 45€ for a 4-course menu may seem excessive for some, but we really felt is was worthwhile. Even more so when considering if you have a full menu in a brasserie or bistro (appetizer + main course + dessert), it quickly adds up to 30-40€. Do take into account that the drinks are expensive and add to the bill. But all in all excellent value for money. Especially because restaurant Patrick Devos uses organic vegetables from closeby organic farm De Hogen Akker in Oedelem. You get a gastronomical dinner with professional service which many vegetarian restaurant could take notice from! We had a lovely culinairy experience in a nice setting. Menu changes about every two months. We will definitely visit again! Previous PostThe end of horse-drawn carriages in NYC. Will Bruges follow?